With all the unpredictable danger and excitement, it's no wonder bull riding is the very last event at a full-fledged rodeo. We have taken this event and turned it into two hours of high energy, on the edge entertainment for the entire family. 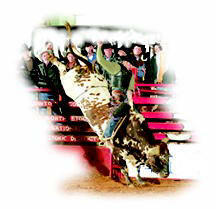 Professional bull riding is one of the hottest and fastest growing extreme sports in the country. Across America, in cities and towns of all sizes and demographics are hosting professional bull riding events. With its unique ability to draw both urban and suburban spectators, it is no surprise that the sport of professional bull riding is one of the premier spectator sports in America. The Battle of the Beast has been featured across the world (Russia, China, Germany, etc.) on the syndicated TV show, 'Voice of America', along with other TV, radio, newspapers and magazines specials. The Battle of the Beast exceeds all expectations of a pro-bull riding event, and has been highly credited for the outstanding professionalism displayed. Each show will consist of the top 30 'IBR' bull riders, competing on some of the toughest bulls in the world of rodeo. 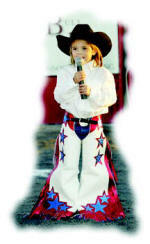 Other events may include cowgirls barrel racing, mutton bustin, cowboy poker, and the wild cow milking contest. We welcome your family and friends to join us and witness the Battle of the Beast! J-W season passes, left tickets, etc, not valid at special events. Bleacher Seating�..bring a blanket to sit on for comfort. Event is usually over around 9:30 pm. General Admission�.Come early for great seating. Great Company or Birthday Outing. The Little Wranglers Rodeo is free with Admittance. Lasso Rope & Stick Barrel Horse Race.